One of my favorite parts of living in New York City is the list of amazing free events offered each summer in New York City. If events like Broadway in Bryant Park happening from 12:30pm-1:30pm for the next couple of Thursdays have you tapping for more, here’s a list of some other big-production, musical freebies that you can enjoy. “Good Morning America” Summer Series: Start off a beautiful summer morning in Central Park while watching your favorite musicians perform. “Good Morning America” has been able to get some of today’s biggest names in the music industry. 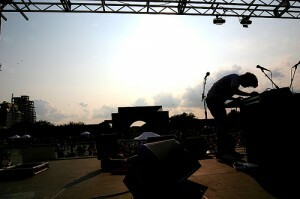 Concerts run from 7 AM – 9 AM, and viewers are encouraged to arrive by 6 AM. Play “Russian roulette” with Rihanna or feel yourself “burnin’ up” with the Jonas Brothers! Toyota Concert Series: The “Today Show” is sponsoring an amazing lineup of free summer concerts in partnership with Toyota. Rockefeller Center is the place to be on Friday mornings at 7 AM for these great concerts. 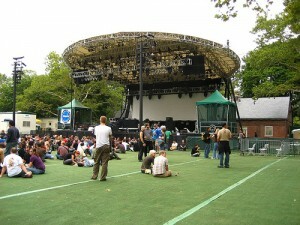 Viewers are encouraged to arrive no later than 6 AM in order to have a view of the stage. Everyone may have already gone “gaga” for Lady Gaga last month, but the rest of the lineup is equally as impressive with performers such as Ke$ha and Katy Perry. Seaside Summer Concert Series: Concert-goers won’t be able to stay in their seats once they hear tunes such as “Love Shack” by The B-52s or anything by the Queen of Soul, Aretha Franklin, at this series. Coney Island will be hopping starting each Thursday night at 7:30PM. Charlie Parker Jazz Festival: Celebrate the bebop sax legend at this two-day festival. Both days of the festival will take place in the neighborhoods where Charlie Parker lived and worked. 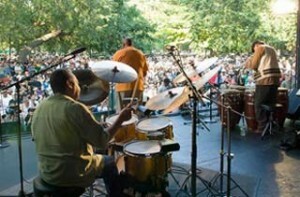 On Saturday August 18, the festival will be held in Marcus Garvey Park from 3PM-7PM and will include performances by McCoy Tyner, Jason Moran and the Bandwagon, The JD Allen Trio, and Revive Da Live’s premier “Charlie Parker Revisited.” On Sunday, August 29, the festival takes place in Tompkins Square Park from 3PM-7PM with scheduled performances by James Moody, Jimmy Scott, Vijay Iyer, and Catherine Russell. This entry was posted on Wednesday, August 4th, 2010 at 1:56 am	and is filed under Stuff to Do. You can follow any responses to this entry through the RSS 2.0 feed. You can leave a response, or trackback from your own site.